Last weekend we took the kids to the Great Wolf Lodge, have you ever been? It’s an incredible indoor water park- a perfect vacation in the middle of winter! While we were there my hubby and kids indulged in some gluten-full snacks, including corn dogs. And boy did they smell oh-so-good. That is when this recipe idea came to me, just in time for the Super Bowl. Game day or not, these little appetizers are perfect for any party. Just make these ahead of time and serve. 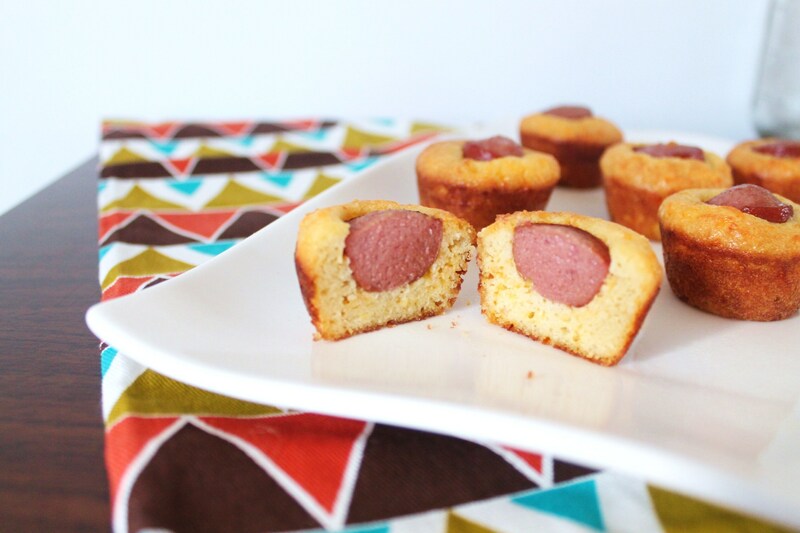 My version of corn dog bites, does not even include the usual main ingredient, corn. As you know, I do not eat corn and have been looking for a way to make something similar to good ‘ole cornbread. Surprisingly, these mini corn dogs are not a far cry from the original and if I must say so myself, are addictive and delicious! If you are going to eat hot dogs, look for organic, uncured all beef hot dogs. If you can eat dairy, may I suggest my cheddar corn dog version. And if you like a little spice, throw in some freshly chopped jalapenos! Definitely double the recipe for a party! So which team will you be rooting for? Even though I am a die-hard Redskins fan, I will be cheering for the Ravens!! 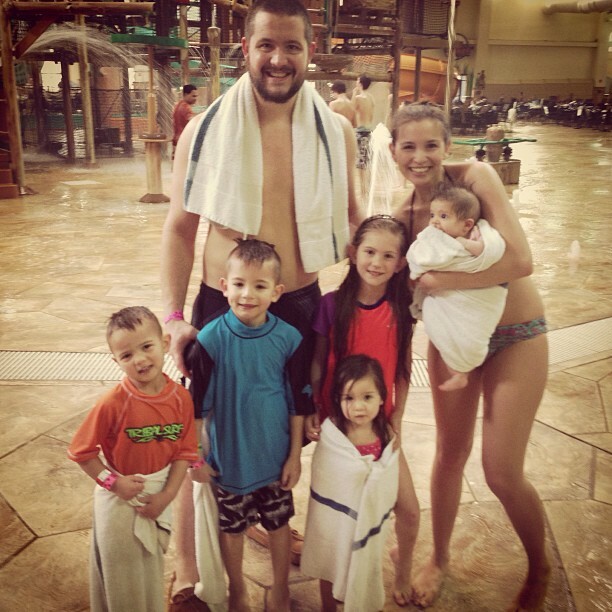 Here is a little family photo taken at the Great Wolf Lodge – the kids had a blast! And I can’t believe I went down those crazy water slides :) My kids sure do keep me young. Ps. Don’t forget to pin your favorite recipes on Pinterest or share them on Facebook, you can also follow me on Instagram @shelley608! I’ve been gluten free for over 2.5 years and have never dared to bake something from scratch. These seemed yummy and easy so I gave it a shot. SO glad I did…DELISH!!! I made these today as a Super Bowl snack for my girls, ages 4 and 5, and they were delicious! I subbed 1/8 of a cup of the almond flour with Masa corn flour, just because we had some, and they turned out great. Thanks for the recipe! Oh my, I missed the family picture below. WOW you don’t look old enough to have all these kids. Beautiful family! Yummy yummy! Just made these and am eating them right now. I made half the batch with cheese sticks sliced into 1″ portions to replace the hotdogs for my daughter who loves cheese. Great recipe! Thank you. I just made these for my husband (who is neither gluten-free nor grain-free/SCD like me) and he loved them! He thought they really tasted like cornbread…real praise from a southern boy. I used ground walnuts in place of the almonds and ghee in place of the butter (which I reduced by half since walnuts contain more oil than almonds) and they turned out wonderfully. Baking at 7,000 feet keeps them from rising as nicely as yours, but the taste more than makes up for their looks :) Thanks for the great recipe! This looks like a fun recipe that I’m sure my teenager would love! We are just starting to investigate a gluten free way of eating for my son. One problem we face is finding recipes that don’t use nut flours as he has allergies to peanut and tree nuts. Can you suggest another flour instead of Almond that would work well in this recipe? Sunflower seed flour can be substituted one-for-one in any recipe calling for almond flour. Simply purchase raw sunflower seeds (unsalted) ~ readily available and inexpensive in grocery stores and bulk food stores… whiz them in your coffee/spice grinder. That’s all there is to it! Same texture and neutral taste… just like almond flour! Enjoy ~ and happy baking! I am wondering if you can make a bunch of these antics freeze them then re heat them larger? These look great and I look forward to making them for my family. We go to Great Wolf Lodge each year and I found out this Aug. that if you have food allergies they will cook the food you bring for you free of charge and have separate utensils and such to use when cooking it. At least that is the case for the Lodge in Traverse City Michigan. This year they made burger patties, chemical free hot dogs, chemical free bacon and our home grown eggs, and they heated a crock pot of chili for us for the day. I found out about their willingness to cook after packing our food for the four days and finding out when we arrived that they don’t allow crock pots, hot plates, or electric frying pans in the rooms. These are amazing! I omitted the honey, and substituted about a tablespoon of baking splenda since we eat a low carb diet. Love the recipe. Thanks! You are very welcome, and thank you for sharing your substitutions! Wonderful! I made these for lunch today and I loved them! I miss corn greatly, but every time I cheat and eat corn, I pay for it! (Days of inflammation and pain, sinus troubles, etc!) 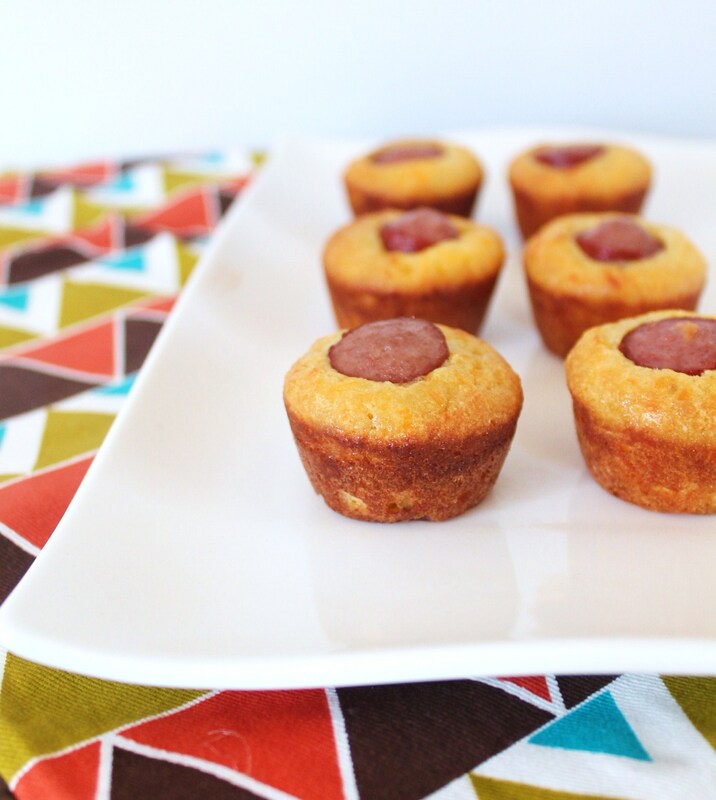 Corn dogs were one of my junk food faves… These were so, so great! Ironically, my 3 and 6 year olds didn’t love them as much as I did (but they have never had a “real” corn dog, so I think it was just an adjustment of the flavor combination in which they weren’t used to. I think most “normal” kids would love them! HA HA! My kids love broccoli and brussel sprouts, so I don’t call them normal in that regard!) Have you been able to achieve a crunchier outside on the bread part? Paleo baking is so difficult to replicate the “real” texture some times. Please share any tricks! 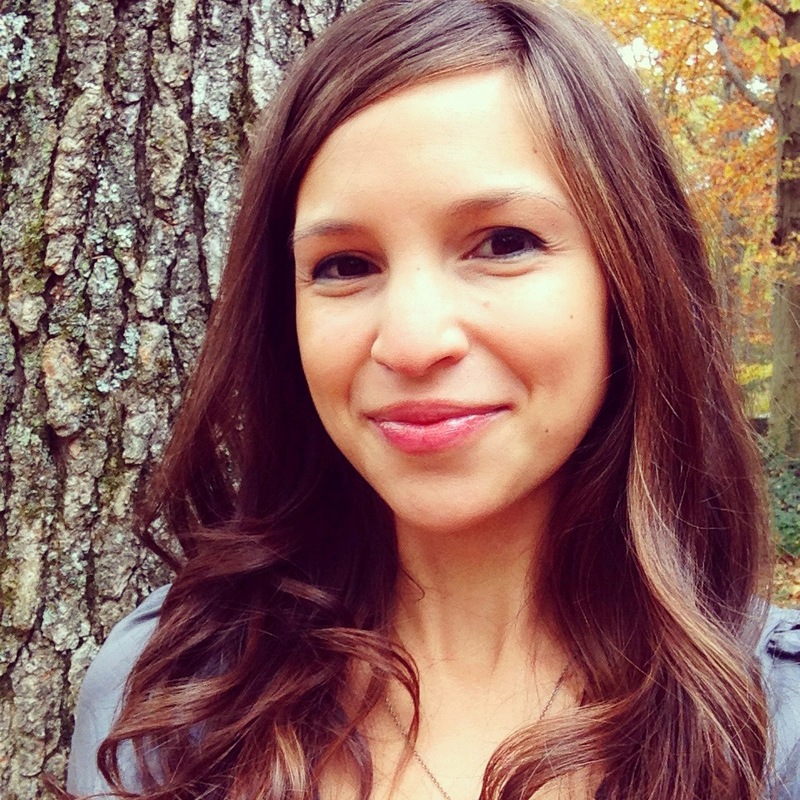 Thanks so much for sharing…. Recipes like this help me along on the paleo journey (which is quite lonely for me – everyone else thinks I am crazy!) Thanks again! We love these, kid friendly and easy! Thank you! Have you used chic pea flour rather than almond flour in any of these recipes? I know it’s carb free like almond flour but curious as to how it works in comparison. Meant to say I know it’s NOT carb free in last post, sorry for mistake.